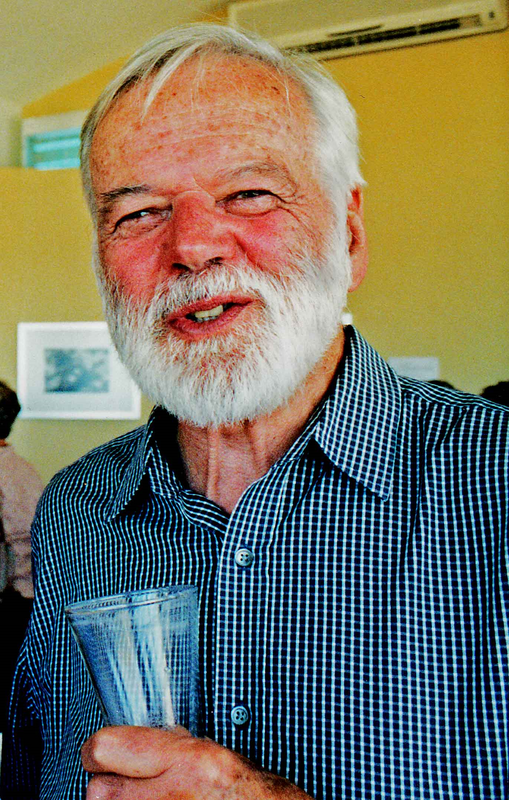 Roy Bradley died on Saturday, August 26th, in the Austin Hospital, Heidelberg, Vic, with his wife, Margaret, and other family members present. His funeral took place on Monday, September 4th, in his home church of St Philips Anglican Church, at 11:00 a.m. 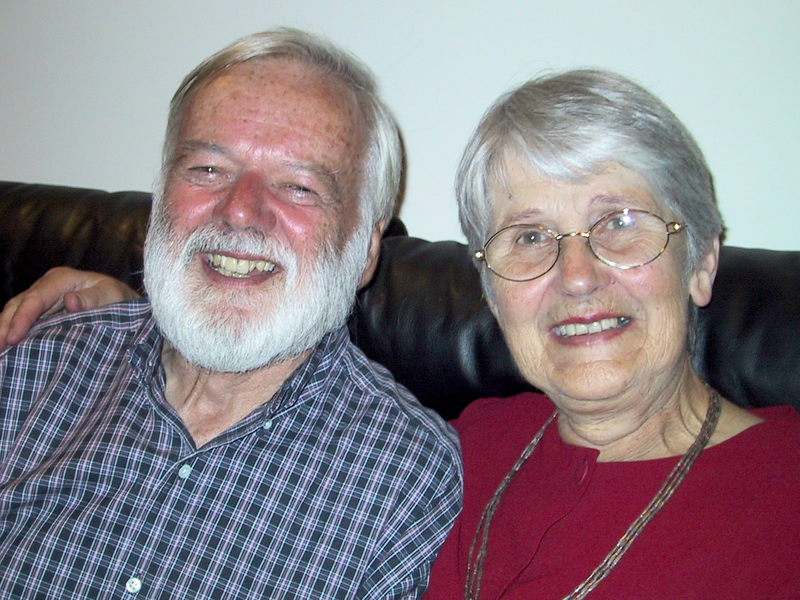 The ANZACPE community extends its sincerest sympathies to Margaret and the family, together with its deep appreciation and gratitude to Roy for his outstanding contribution to the CPE movement in Australia and New Zealand. Roy & Judith in Perth. Roy spent seven years in Perth as a supervisor. As a pioneer of CPE in Australia, Roy was well-loved and admired by so many of us as a wise colleague, a truly empathic chaplain, a skilled clinical pastoral educator and a warm and insightful friend. 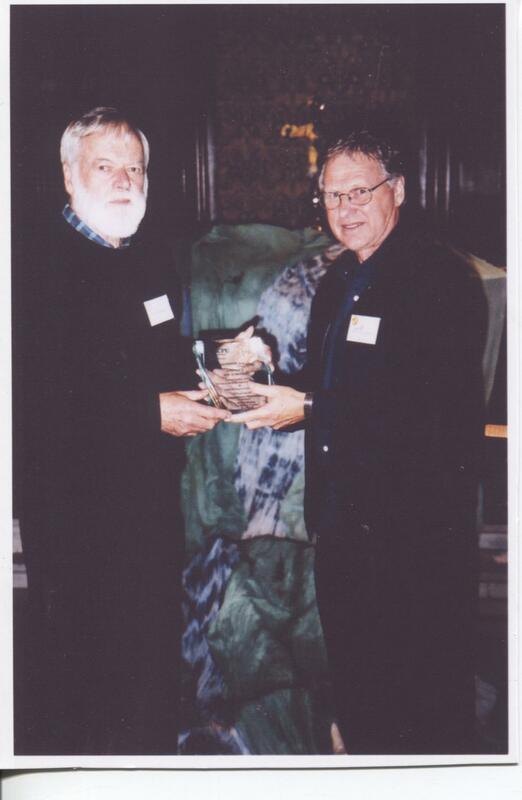 While Roy contributed to the world of CPE in a variety of the ANZACPE Associations, his CPE home base was in Victoria. In 2011 Graeme Gibbons produced an appreciation of Roy for ASACPEV (formerly ASPEA), which was published in that Association’s website. You can access that article by clicking here. Roy Bradley died suddenly on Saturday afternoon August 26th in Melbourne. After studying at Melbourne University and Trinity College, he was ordained Deacon in Ballarat in 1952 and priested that same year, also in Ballarat. He served as Curate in Horsham (1952); Priest in Charge in Natimuk (1953-57); Rector of Kyabram (1957-59); Chair of the Department of Chaplaincies in the Diocese of Melbourne (1959-74); was awarded a Fulbright Scholarship in 1963; Chaplain to Royal Perth Hospital and Director of Pastoral Care (1975-82); Warden of the Avalon Community, Melbourne (1982-87) and as Consultant on Pastoral Care to the Archbishop of Melbourne (1987-92). Roy retired in Melbourne in 1992. We give thanks to God for the life and ministry of the Reverend Roy Bradley and pray for Margaret and their family and friends at this difficult time. May he rest in peace and rise in glory. “My first contact with Roy was at the New Zealand Hospital Chaplains’ Conference, in Palmerston North, where Roy was the keynote presenter. But, my ongoing contact with him was from 1989 when I had my first engagement with the organisation that in 1990 officially became ANZACPE. Roy was on my review committee in Canberra in 1991 where I was recommended for Level II accreditation. His presence and interaction with me on that occasion was memorable and reflected his wisdom, warmth and humanity. I will remember Roy for above all else for those attributes. Many of the younger supervisors in New Zealand will not have had any direct contact with Roy. However they, too, will have been enriched by Roy’s wisdom and influence through their Australian colleagues whose supervisory work had been directly influenced by Roy. QICPE have asked me to include our greetings for the family of Roy. I and Keith McCollum are about the only ones up here who would remember Roy. I have memories of a wise man who could find the way through difficult situations. He was also on one of my reaccreditation committees so i remember him with fondness and respect. Like many, I am struck by the end of an era with the death of one of the giants of the CPE movement. Probably none of us, least of all Roy, will ever realise how many lives we affect in supervisory ministry. I hope when we write up our memories we will be brave enough to add the eccentric and the difficult, as well as the creative and joyful, in order that we honour a true picture of the great man. Allow me to add one eccentric story in that may not be in the memory of others. 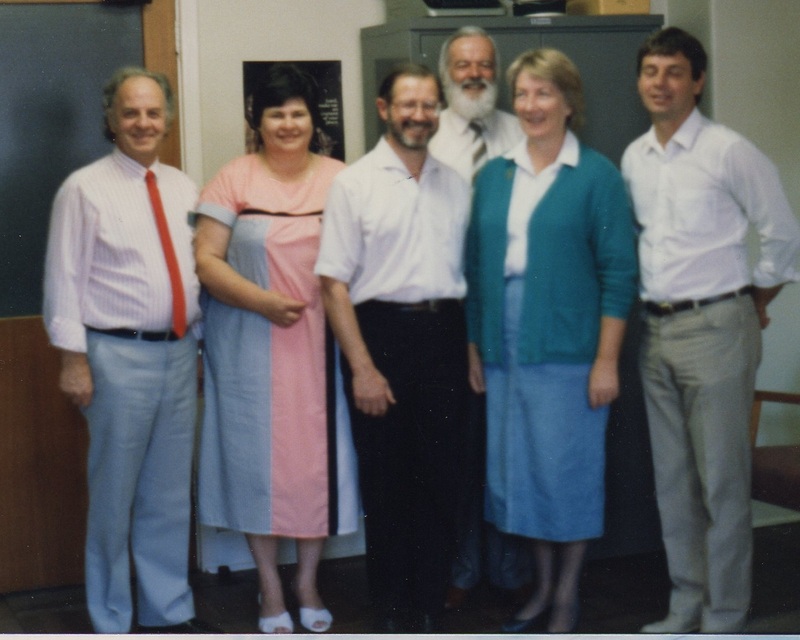 When we were celebrating the first anniversary of ANZACPE in Canberra (was it 1987 or 1988?) a large cake with one candle was prepared for the celebration. At the opportune moment Roy, picked up a very large knife, looked over at me and sister Evelyn Crotty and said – in a warm friendly, but from our point of view patronising voice – ‘Let’s ask the two most junior supervisors to cut the cake’. As Evelyn and I walked across the very large room I said quietly, and with a mischievous twinkle in my eye, ‘Do you want to stab him with the knife or will I’. Roy never knew! I missed you all in Perth and look forward to meeting up again in Hobart. From the South Australia Association, who remember with fondness Roy’s trips to our part of the world. In this picture Roy is back and slightly off-centre. Front and left is Dean Brook, with Bizz Jelly alongside of him. Far right is Bob Kempe. Thank you for this space to respond to the sad loss of Roy Bradley and to those who have added to the picture of Roy’s magnificent contribution to CPE. He was my supervisor in my first quarter of training and for my last quarter some years later. One of the many great qualities that Roy brought to CPE was his ability to meet people at their point of need. He did it with his patients, with his students, with colleagues and with hospital staff no matter what their status. His influence will be felt for generations to come. ACPEWA executive and members extend their deepest sympathy to Margaret and the extended family in the sudden death of Roy. We are grateful to Roy and his family for their vision and generosity to move to Perth and bring CPE here in the mid 1970’s. 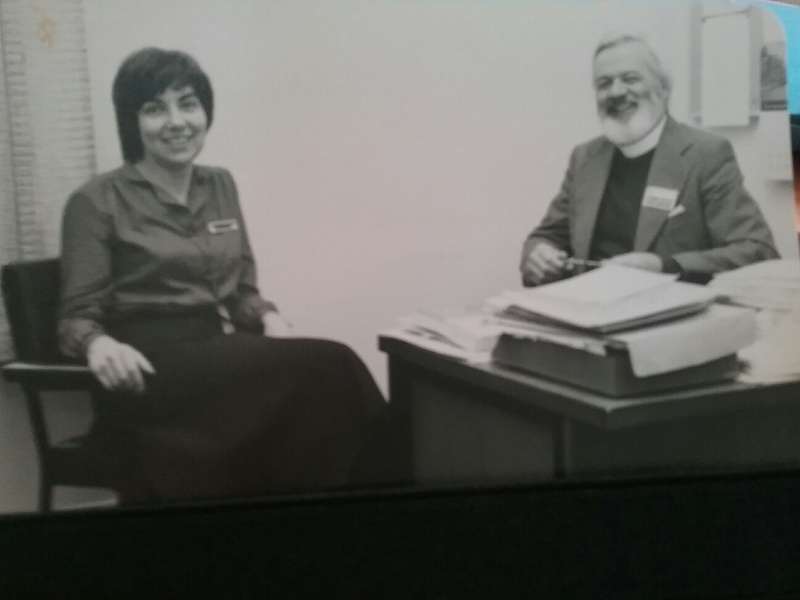 Roy’s work of pastoral formation of clergy and laity at the CPE centre at Royal Perth Hospital built a foundation of skilled chaplains and compassionate clergy that has impacted healthcare in WA to this day. Roy is remembered for his genuine and truly empathic pastoral ministry over many years. He modelled a pastoral leadership style that valued his own human story, inclusive of wondering and suffering and was able to mirror and recognise these qualities in the stories of others. We send our thought and prayers across the Nullabour to all who mourn Roy’s passing at this sad time. Many warm memories come to me as I think of Roy and all he offered me at an important point in life. I am pleased to hear of the intention to honour his memory in our own Association and in ANZACPE. I never met Roy but his name is very familiar to me as I have heard it spoken and seen it written with some significant reverence. I feel like a relative I never met but have been deeply impacted by has gone. I met Roy only briefly. What I know of him is from the stories told by others. One of my favourite quotes, adapted loosely by me, comes from words of Roy which Gillian Henderson passed on. I am grateful that Roy’s life and work continue on in the CPE community. Roy’s attendance at the Peer Supervisor Education Group held on 24 June 2017, the last ASACPEV Inc. function that Roy attended, will remain with me as a treasured memory. I had the privilege to lead this small group session, my topic being ‘Learning Effective Communication from a Person with Dementia’. Roy was sitting next to me on my right. The gift of his attentive presence was very moving. Roy’s presence has been described by a number of people as Roy just always seeming to be there in the background holding a space. These words resonated strongly with my experience of Roy on this occasion also. While I was seeking to talk about effective communication, it was Roy who embodied this in his listening presence and in his question of me at the end of my presentation. His question touched the heart and concern of the issue for me, meeting me at my “point of need” as Gill Henderson noted in her eulogy delivered at Roy’s funeral service. I felt I was given the full gift of Roy’s inspiring, insightful, challenging and pioneering leadership in Clinical Pastoral Education captured in a gem in this small group session on a Saturday morning. Roy Bradley was my supervisor at the Austin Hospital in 1967.Together with another New Zealander Jeremy Shaw we were his first pupils in C.P.E in Australasia. I am forever grateful to Roy for what he taught me about expressing your own humanity. He preached in my parish church in Wellington and looking at my wife told the congregation to “Launch out into the deep”We ended up at St.Luke’s Hospital Houston. Roy was a humble,fully integrated person,with a great sense of fun and rich spirituality. He leaves a rich legacy and many grateful students. Warm greetings and Aroha to Margaret and the family.We have lost a great member of the human Whanau. Winton Davies. Wanaka New Zealand.